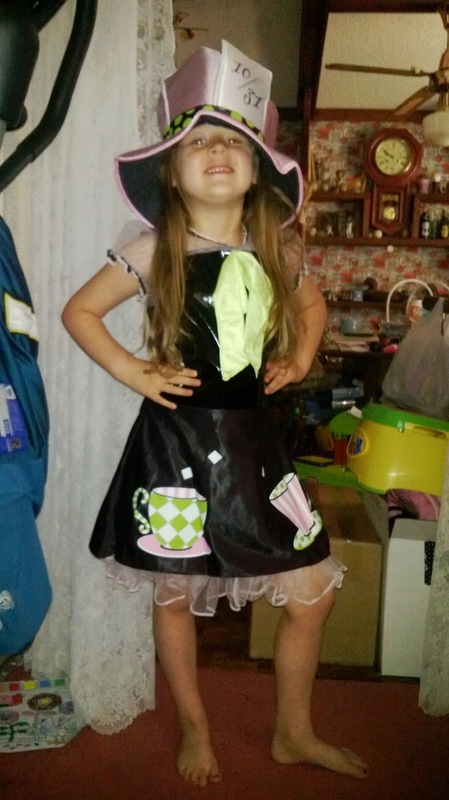 We love our new costume from Costume Discounters my daughter is the one really excited about the Go mad, be the Hatter! She has been wearing this costume all around the house and won't take it off. She has been really into Alice and Wonderland lately and I wanted her to know the Understanding the Hatter and to know what the story is about not just like the costume just to like it. Costume Discounters have a wide variety of Alice and Wonderland items to pick from. 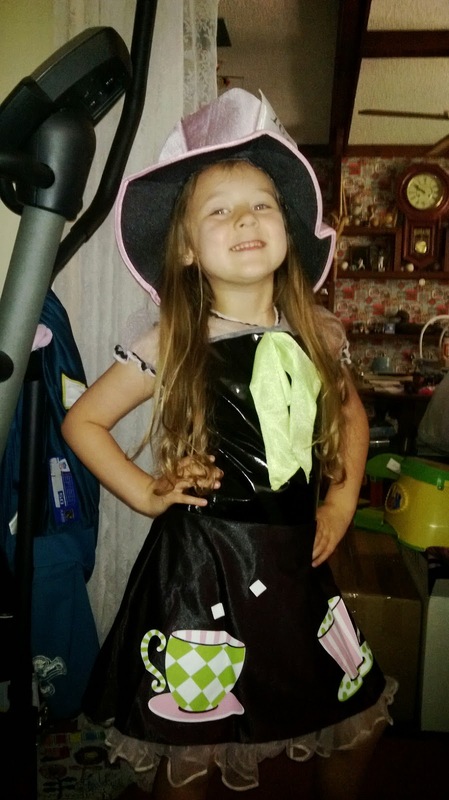 The one we got is the mad hatter child costume which she loves and says she is going to wear it this Halloween. The hat was a little but that is ok she loved it!!! And is really excited to wear it this fall. It is made with really good quality material. As you can tell she likes to pose. And this costume was a winner. It retails for around $25.00 and comes in sizes Med and Large. 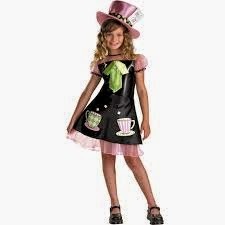 Our Mad Hatter Costume for girls offers all the fun of being totally crazy without being totally mad. The one piece costume comes with short sleeves and a hemline that falls at the knees. The black vinyl torso is decorated at the chest by a large green bow in satin. The neckline and sleeves of the dress are cut from a sheer pink fabric and then trimmed in black to keep with the motif of the costume. The skirt portion of the dress is made form satin with two large tea cup prints stitched onto either side. Small white squares, representing sugar cubes can be seen in between these two cups. Trimming the knee-length hemline of the dress is more of the sheer pink fabric from the upper body which creates a nice framing effect on the overall costume. 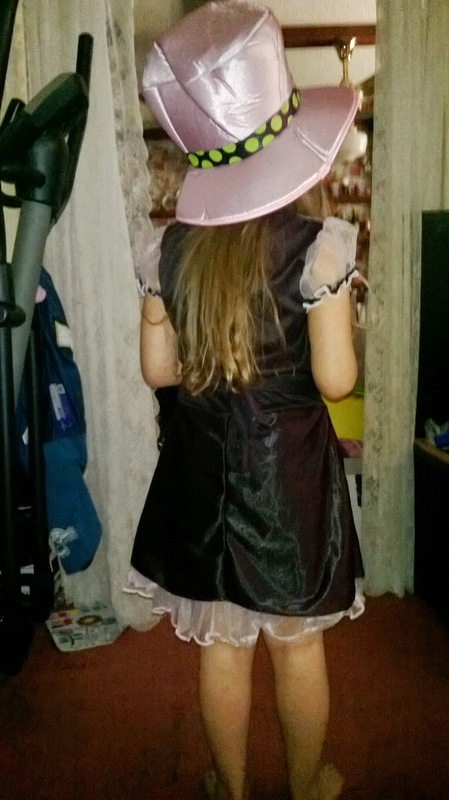 Simply put on the pink satin Mad Hatter inspired top hat and she'll be ready for the tea party come Halloween! I had never heard of the company. I will keep them in mind if I am in search of a costume.